Earlier this year I sent Holmes Volume 1 to Chris McVeigh the founder of Fahrenheit Press. Having come across them on Twitter, I liked their record label-type approach to publishing and so I thought why not see if they could do something with my stuff? I wasn’t actually expecting to hear anything back other than perhaps a thank you but no thank you. Publishers receive hundreds of manuscript submissions and Fahrenheit have some signed some top authors, so I was limiting my expectations. The general perception is that writers send their work to hundreds of publishers and literary agents before someone shows an interest. This is only the second time I’ve tried having previously pinged A Scandal in Boro off to Curtis Brown. They liked it but said none of their agents felt they could represent it. Consequently, when the response came back from Fahrenheit a few days later it was quite a surprise. Chris emailed me back personally to say he really liked the stories and it was clear I could write and that my humour was “just the right side of smart-arse”. Both of these being qualities that are valued at Fahrenheit. There was however an issue. Although Chris was a fan of the writing and the stories, he had reservations on how successfully Fahrenheit could market Sherlock Holmes stories given the current popularity of the US TV series Elementary and the BBC’s Sherlock. He said people would see the books as fanfiction and a derivative these shows, when in his opinion they were better than both. This was very nice to hear. The funny thing is I got very similar feedback from author John Nicholson after sending him some early drafts back in 2015. Since the books have been published, I’ve also been told that people imagine the characters as Benedict Cumberbatch and Martin Freeman. Odd really because when I was writing them I had Bob Mortimer and Vic Reeves in mind. I can’t really see Benedict Cumberbatch as a foul-mouthed, beer-swilling Teessider. Chris’ solution was to dial down the Holmes and Watson thing and turn the books into a more “subtle homage”. Initially, I wasn’t sure. The “homage” in the books is much more than character names in that there are all sorts of nods and winks to Sir Arthur’s original canon and the Holmes thing is very much hard-wired in to the stories. However, a few days later Chris called me from his office in Santa Monica (yeah that’s Santa Monica in America) and we discussed it. My thought was that it would be better for me to write something new. Chris said he would take a look at that, but still was still keen to publish what I already had. He said that although he no longer read for fun, he had rattled through the first four of the stories and was hooked. Holmes was his “guilty secret” and he was reading them whenever he got a spare moment. Following our transatlantic call and a very short period of deliberation, I agreed. I think the thing that turned my reservations around was Chris saying the stories were too good not to be read. Obvious, they have been read, and the feedback has been really encouraging, however Chris would be able to get the stories in front of a much larger audience than myself and my band of mates could. Besides, who was I to argue with someone who has been in the industry for twenty-five years? On the bus ride to a pub in town, I emailed Chris to tell him I was up for it. Over the next week or so, and another visit to the pub, Sherlock Holmes regenerated into Victor Locke and the short-suffering Doctor John Watson became Doctor Jonathon Doyle… The rest is literature. Holmes and Watson weren’t however the only people who got a shiny new name. One thing that did worry me was that if I published the books under my name, people who’d bought the originals would read them and think “hang on a minute… this is the same book as before”. Consequently, I used a pen name and I am now aka Michael RN Jones. Despite my initial reservations, I’ve grown to like the idea. 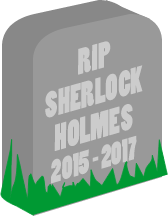 The books are still quite obviously, Sherlock Holmes stories, however this only now becomes apparent as the reader gets into them, i.e. no more visions of a donkey jacketed Cumberbatch. The first book also has a title rather than Volume 1 and goes by the name of The Accidental Detective. I’m also really pleased with the cover design they came up with… Sorry ladies I’m no longer on it. 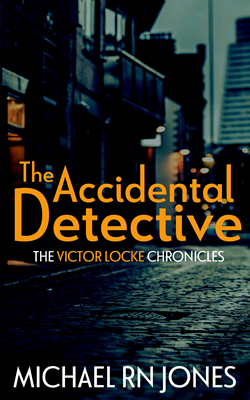 The Accidental Detective: The Victor Locke Chronicles is published by Fahrenheit Press and is available now on Kindle. For further information regarding the Victor Locke Chronicles follow Michael RN Jones on Twitter.